The informal readings in the upstairs room of an Islington pub this summer, organised to mark the publication of Diagrams for Seriality by Neil Chapman, belied the ambitions of new publisher Copy Press. Chapman’s paperback is the seventh in the Press’s Common Intellectual series, launched in 2013. Seven titles in the space of about a year, delivered in close succession by a small, self-funded publisher, are something to be both celebrated and admired – especially as these sorts of books, despite Copy Press’s claim that they ‘provide a proposition for living, thinking and enjoyment’, can be difficult, abstract and have a limited, if self-generating, audience. Other than rhetoric, what does this statement mean? Why this identification with the political from a publisher born covertly from art? To be clear, most publishing is by definition not political. The subject matter of the books published is irrelevant to the means by which they are published, which in the main is by large corporations primarily interested in shareholders’ returns. Independent publishers, with their concurrent potential for independent thought, were decimated by corporate takeovers in the post- Thatcher and post-Reagan decades, the history of which was best documented by the late New Press founder, André Schiffrin, in The Business of Books.4 Of the surviving independent publishers, many would claim a political position and fail to live up to it. Their broad range of published positions present an apparent smorgasbord of political argument that on closer reading builds neither a theoretical opposition to a status quo, nor an expanding audience. Notable exceptions to this exist, such as Verso, Pluto Press and Zero Books. However, by comparison, Copy Press is claiming a very different territory – one that evades direct engagement in a recognisably political movement, subject or language, whether radical, theoretical, geographical or merely polemical. Perhaps the editors are simply calling for the act of independent publishing to be seen as a political way to address the lack of independence outlined above. This would be lacklustre: their claim can only have meaning if understood within the conjunction ‘these times’, the forcing together of the present and history, and more abstractly, in the foregrounding – against the conventions of the current moment – of the potential opened up by art and experimentation. 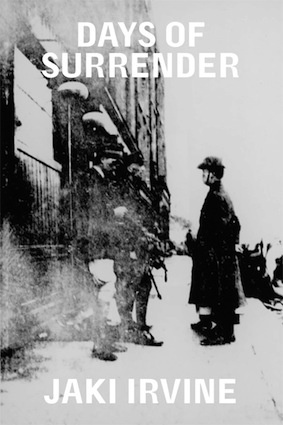 The sixth title in the Common Intellectual series, Days of Surrender, by the artist Jaki Irvine, perhaps most directly approaches identifiable political territory through its account of the Easter Rising – the week-long insurrection in April 1916 by Irish nationalists and revolutionaries that has come to define twentieth-century Irish history. Less well-known, and possibly historically obscured, is the role in the events of Cumann na mBan, the Irishwomen’s council and paramilitary organisation in the events. Told exclusively from their perspective, and in the form of both direct and narrated dialect, the reader is soon immersed in the actions that unfolded. The book’s starting point is a rare photograph that shows the feet of Elizabeth O’Farrell – a midwife and volunteer who had been asked to make the perilous walk from the Dublin General Post Office down the sniper-lined streets to act as agent of negotiation for the formal surrender – poking out from behind the figure of Padraic Pearse, leader of the Irish Volunteers, at the formal capitulation of the Irish Volunteers and Irish Citizen’s Army to the British command. A rare photograph because all later published photographs doctor the image, and this trace of a woman’s presence and resistance to the British state is thus removed. Here is one starting point at least; perhaps this story, this layered cacophony of voices, names, violence, love, death and glory, also starts at the end, with another photograph taken in the same year, of the thirty or so surviving women, grouped as if for a conventional portrait in a Dublin garden. Without reading the narrative, the civilian clothes and nurses uniforms give little indication of the subterfuge, clandestine smuggling and flirting utilised to navigate the machine-gun-strafed streets of Dublin, nor the revolutionary vigour of the many hands in this photograph that had taken up arms and fixed others in their sights. A rare photograph because all later published photographs doctor the image, and this trace of a woman’s presence and resistance to the British state is thus removed. Bookending a story with two extraordinary photographs sets a challenge for any writer. Yet Irvine’s Joycean lists and fragmented vignettes tell a story both familiar and entirely new. James Connelly, Marxist intellectual, founder of the Irish Labour Party, member of the Industrial Workers of the World and leader of the Irish Citizen’s Army, is for most of the short book a fallen hero. He is bleeding-out in the final hours of the insurrection, as the General Post Office, which he had taken control of as a base for the fighting, crumbles around him under the sustained attack of the British. He would no doubt have appreciated this book’s revolutionary materialism, whilst perhaps being astonished at the fervour and commitment of the women volunteers. What Irvine has managed to do so convincingly is take a now familiar structure and process – the archival image that reveals the revisions of history’s victors – and create a narrative that shirks away from the conventions of academic writing, whilst simultaneously giving a necessary two fingers to the triteness of contemporary historical fiction. And so, from starting point to counterpoint, this gesture also strikes against the re-invigorated political revisionism of today. Reading this book in the year of the defeated campaign of another national independence movement, a year that also marks the centennial anniversary of the First World War, those two fingers also seem the only credible response to the next wave of Unionist flag-waving and centennial re-writing by those sunk in the government’s armchairs of abhorrent wars and immiseration. If 1914’s imperial slaughter, the uprising of 1916, the Russian revolution of 1917, and the punitive peace accords of 1918 – let alone the flu epidemic of the same year – are at risk of being consigned to the dustbin of history, then publishing books like Irvine’s seems both political and necessary. A necessity that ‘presses hard’, as Yve Lomax asserts in her Copy Press book PURE MEANS: writing, photographs and an insurrection of being, and a necessity that can, for both reader and writer, also be a pleasure.6 Pleasure courses through Days of Surrender in descriptions of felicitous petticoats, bicycles and rifle-training, strange and everyday moments narrated in dialect, and in the lists of names and streets that fill the page. In PURE MEANS it is less material, more abstract, a pleasure that is worked on, interrogated, stripped bare, until it finds itself in the end, in a celebration of inoperation and inoperability. 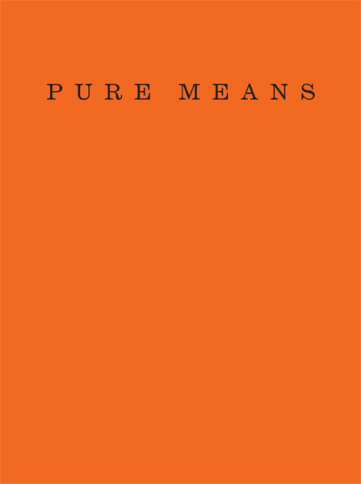 PURE MEANS: writing, photographs and an insurrection of being, is the first book in the Paraclete series – an ‘occasional’ larger format Copy Press strand that offers space to address ‘what we can make of advocation’.7 If Common Intellectual makes room for the sort of writing that eschews the conventions of publishing and readability, Paraclete formalises this oppositional mode, and through PURE MEANS appears to position the series in defence of a continental intellectualism. Lomax’s own advocation is of, at heart, writing and language. Proceeding via Foucault, Agamben, Althusser and Badiou, her book is about the process of becoming a writer, or subject, through negotiating the apparatus of writing: state, institution, academy, instrument, even material. It opens, ‘A title is being scribbled on a scrap of paper; it has to be written down’, foregrounding the materiality of means – words, paper, pen, language – and the immateriality of the subject. The chapters go on to describe the relationship between ‘the author’ – here, following Foucault, firmly sandwiched in quotation marks – and authority, as in finding an authorial voice or form in order to write. But necessity, the need to write it down, is the main narrative drive: pressing hard, turning the unwritten into the written, moving from author as individual to author as an abstracted authorial function, all the time resisting the dialectical pitfall of becoming a mere functionary. This might seem a tired point of departure for readers already adrift in the gyre of the reading art world and immersed in the straitjacket of theory; in many ways PURE MEANS reflects the sort of apparatus it might be expected to unpick. Made up of extended reflections on philosophical thought the book tends to read as both institutional reading list and product of current art school curriculums – Lomax is Professor in Art Writing at Goldsmiths, as well as an artist, and there is no doubt that the references cited reflect a wider institutional concern, if not convention. The book is divided into five chapters and a prologue, with chapter titles suggesting a determined outcome: ‘Necessity’, ‘Consideration’, ‘Let it happen!’, ‘Beautiful’, ‘Originary Freedom’. Each chapter is presented in numbered paragraphs, and is supplemented with extended numbered endnotes, referring to the numbered chapter. The effect is as structured as the apparatus she seeks to escape. There is also, however, an integral playfulness that attempts to pre-empt these constraints and seeks to reveal fleeting moments or gestures of reaction that might give rise to something ungovernable. Inserted into the text, and forming counter-rhythms to the formal structure, are glitches, halts, stutters – often physical acts that are both the process of writing and incommensurable with it: a refusal or resistance on the part of the subject to the process of subjectification. The gesture, here, is considered via Agamben as the outcome of the ‘special relationship’ between celebration and inoperativity. Freed from the process of work, the outcome becomes the revelation of a possibility. Modes of inoperation, often condemned as mere gestures – the strike, for example – are therefore to be celebrated as refusals of functionality. This is perhaps how the insertion in the book of a small series of photographs, details of wild flowers, entwined, rampant, is meant to be read; nature, not as alternative to culture, but as alternative to work. Here the book is at its best – an advocacy for the twining of celebration and inoperation, for the ceasing of work, for the strike, the uprising, for celebration without purpose, without prescribed end. The idea of advocacy is also echoed within the structure of the Copy Press Reader’s Union, where to ‘become a member is to make the union happen and enable its development’, promising a common, if presumably, at least in part, imaginary ‘space where writers and readers can come together’.9 Readings, events, conversations and celebrations are promised, with fees for the waged – none for the unwaged. The Left Book Club, founded in 1936 by John Strachey, Stafford Cripps and Victor Gollancz had similar aims, though it was more explicitly and radically political. Surviving a decade of success, with at its peak 45,000 members, its methods reflected a more material, pedagogical and economic approach: a reading club with the specific aim of educating a working-class readership with left-orientated literature. The current reading climate seems more problematised, less concerned with the pursuit of education, aesthetic immersion or plot-driven pleasure, but bound to media and the market through reader reviews and posted recommendations. Colin Robinson, of radical US-based publishers OR Books, has argued that the world seems to be full of writers, with not enough readers out there.10 If this new Reader’s Union of Copy Press is to survive it must create a forum that produces as well as attracts readers that can drive the demand for publishing in new directions. Against the odds, a Union that walks away from profit, celebrity, fleeting contemporariness and political convention, with members determined to eschew the familiar, in favour of change, independence and freedom. Copy Press will be at the New York Art Book Fair, 26–28 September 2014. Titles from the Common Intellectual series will be available amongst those of other artist-led publishers at the Three Letter Words stand (booth A50). AA Bronson co-founded the seminal art collective General Idea in 1969. This interview, conducted in June 2010 by artist Sissu Tarka, centres on historical and contemporary alternative approaches to schooling and art education. Louise O’Hare of Publish and Be Damned talks to Nick Thurston of information as material about the impulse to self-publish. Anne Tallentire and Lisa Panting share thoughts on alternative cartographies, territories, and itinerant means of questioning social, political and institutional systems.